British carmaker Jaguar is all set to revamp its XJ model range, which will go on sale from autumn this year. The list of variants of the upgraded XJ will also include the XJR575. Jaguar fans would have figured it out by now that the letter ‘R’ means it will be a performance-oriented derivative of the company’s limousine and will also be the flagship offering from the carmaker. The updated XJR575 houses the same 5.0-litre, supercharged V8 petrol engine but pack more punch than its predecessor. The engine belts out 575PS of power and 700Nm of torque, which is 25PS and 20Nm more than the XJR variant released in 2014. Transmission duties are handled by an 8-speed automatic transmission and power is sent to the rear wheels only. The setup is enough for the car, which weighs around 2 tonnes, to hit 100kmph from standstill in 4.4 seconds and reach a top speed of 300kmph. Just to keep the XJR575 away from the regular bunch, the SVO (special vehicle operations) team was consulted. As a result, customers opting for the super-fast XJ will have the option to choose from two bespoke body paints - Velocity Blue and Satin Corris Grey. That’s not all. The XJR575 will also feature some tailor-made detailing like a rear spoiler, side sills, front bumper and lower air intakes featuring Gloss Black surrounds. To ensure that anyone who doesn’t notice these cosmetic differences indeed does, the XJR575 will also wear its name at the back. Additionally, the twin bonnet louvres mark the vehicle out from the rest of the range while 20-inch Farallon gloss-black wheels with red brake callipers are the final dynamic flourish. Inside the cabin, there are embossed tread plates, ‘575’ intaglio and diamond-quilted seating available in multiple colour options and finished with additional ‘575’ branding. All the variants of the 2018 XJ model range will be available in both regular and long-wheelbase versions. A total of six different variants are expected to hit the showrooms, comprising of one diesel (3.0-litre) and two petrol (3.0-litre and 5.0-litre) engine options. 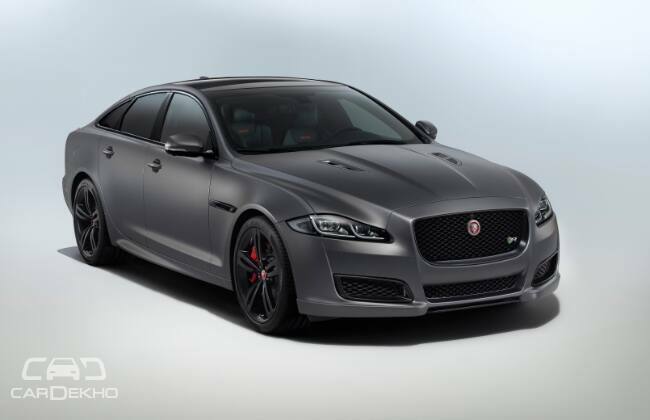 The Jaguar XJ lineup has always faced rivalry from the Audi A8, BMW 7 Series and the Mercedes-Benz S-Class. Once launched, the Brit will fight the battle with a lot more in its arsenal.